Upon the purchase of Russian America, Sitka, Alaska became the Territory Capitol in 1867. After the capitol was moved to Juneau, the Legislature met in rented rooms around the city. Construction for a capitol building was partly funded by the United States Congress, but they refused to give more. Local citizens managed to pay the rest of the cost for land, which was then given to the government. Construction on the building began on September 18, 1929, and it ended on February 2, 1931. The building, originally named the Federal and Territorial Building was dedicated on February 14, 1931. It hosted federal services until 1959, where the Alaska Statehood Act granted Alaska permission to settle in the building. The capitol has been attempted to be relocated. These attempts began as early as 1960, where a proposal to move the government to the Cook Inlet area failed. The most recent attempt was in 2002. The building is six stories high and made from brick-faced reinforced concrete, with a facade of Indiana limestone on the first two floors. The portico has four columns made of Tokeen marble from Prince of Wales Island, which is also used for interior trim. Because it lacks the large landscaped grounds of most state capitols, it could appear to be simply an office building. It is one of only twelve state capitols (along with those of Delaware, Hawaii, Louisiana, New Mexico, New York, North Dakota, Ohio, Tennessee, Nebraska, Florida and Virginia) that do not feature a dome. Outside the building is a replica of the Liberty Bell, of the type given to all states and territories by the federal government in 1950 to help raise support for savings bond drives. The lobby features clay murals titled Harvest of the Land and Harvest of the Sea, representing hunting and fishing, as well as a bust of Alaska Native activist Elizabeth Peratrovich. Offices and committee rooms fill the ground and first floors. 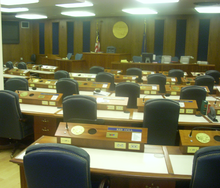 The second floor houses the chambers of the Alaska Senate and Alaska House of Representatives, as well as committee rooms. The walls feature the work of early Juneau photographers Lloyd Winter and Percy Pond, and busts of the first two U.S. Senators from Alaska, Bob Bartlett and Ernest Gruening. The Alaska Governor and Lieutenant Governor's offices are located on the third floor. The executive office doors are made of black birch, with hand carvings depicting Alaskan industry. The "Hall of Governors" features portraits of governors and lieutenant governors of Alaska from the District of Alaska era to the present. More legislative offices and committee rooms occupy the fourth floor. The fifth floor holds legislative finance committees. Many areas of the building have been restored to their original 1930s appearance, especially on the second and fifth floors—the latter originally had federal courtrooms. In 2012, the State of Alaska undertook a 4-year, $33 million project to provide seismic upgrades to the building as well as further restore the building to its original appearance. ^ a b c d Capitol Tour & History. State of Alaska. ^ "Alaska's State Capital - Juneau, Alaska". Travel Juneau. Retrieved 8 December 2017. ^ "Travel Alaska - Sitka". State of Alaska. Retrieved 8 December 2017. ^ a b "Alaska State Legislature". State of Alaska. Retrieved 8 December 2017. ^ "Capitol Move History". State of Alaska. Retrieved 8 December 2017. ^ "Capitol Tour" (PDF). State of Alaska. Retrieved 8 December 2017. Wikimedia Commons has media related to Alaska State Capitol. This page was last edited on 20 December 2018, at 06:53 (UTC).